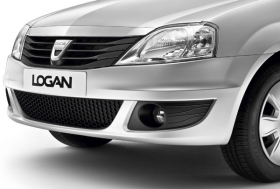 Renault-owned Dacia, which makes the Logan, has seen its French sales surge. Scrapping bonuses pushed up French new-car sales and helped Spain break a run of 16 straight months of declining new-car volumes. Passenger-car sales in France were up 7 percent in August to 110,607 units, carmakers' association CCFA said on Tuesday, while light utility vehicle sales, which are not eligible for payouts, plunged. August 2009 had 21 working days, compared with 20 in August 2008. Adjusted for the same number of working days, the passenger-car sales increase was 1.9 percent in the month, CCFA said. In the first eight months of the year passenger-car sales were up 1.1 percent to 1.43 million units. Light utility vehicle sales dropped 24.9 percent year-on-year in August, and were down 23.5 percent in the first eight months. France's No. 1 carmaker, PSA/Peugeot-Citroen, saw a 17.3 percent increase in August sales, taking its market share to 29.8 percent. Peugeot sales were up 15.8 percent and Citroen sales rose 19.1 percent in the month. Smaller rival Renault posted an 11.1 percent increase in group sales in August, leaving it with a market share of 24.1 percent. Sales from its Romania-based Dacia brand -- which makes the low-cost Logan model -- were up 62.1 percent and Renault brand sales rose 3.7 percent last month. Spanish car sales were virtually unchanged in August from the same month a year earlier. New-car sales totaled 58,510 vehicles in August, only 20 units fewer than in August 2008, car industry association ANFAC said on Tuesday. The flat data followed a month-on-month decline of 10.9 percent in July and took car sales for the first eight months of the year to almost 600,000, down 32 percent from 2008. In May, Spain began offering a 2,000 euro subsidy to new-car buyers whoe were struggling to counter credit restrictions and soaring unemployment. ANFAC expects the 200 million euro subsidy to boost 2009 sales by 100,000 units. The bonus comes in addition to a 700 million euro subsidy given to encourage people to replace old vehicles for energy-efficient cars. Italian car sales are due out at 17:00 CET, with a 9 percent year-on-year increase expected, Il Giornale reported, citing unnamed car manufacturers. U.S. automotive sales are due out at the same time, and are expected to reach a 20-month high thanks to government incentives. Car sales for Germany, Europe's biggest market, are due out on Wednesday. In other markets, Japan's overall sales fell 0.5 percent year-on-year, but were up 2.3 percent when excluding 660cc minivehicles, marking the first gain in 13 months, the Japan Automobile Dealers Association said. South Korea's automakers revealed mixed fortunes, with Hyundai Motor Co.'s sales climbing 25 percent, Kia Motors Corp.'s rising 4.1 percent, but GM Daewoo's dropping 22.9 percent.